Nature Walk. The tiny pompino is actually a fish. Scrape, slurp, plunk: Melanie Hoffman skillfully scooped out a handful of wet sand and dumped it into a metal kitchen strainer. Then, putting the pointed bottom of the strainer in a container of water, she sifted the sand and water out, exposing the small organisms living in the sand. "Look at what we found!" she exclaimed. Immediately, eight small feet crowded closer and four heads bent intently over the strainer. The children began analyzing the results: a small crab, a water beetle and a few "sand critters." In a few minutes, the children and adults participating in the Tybee Island Marine Science Center's Discovery Walk would grab their own strainers and buckets of water to see what they could dig up. Sand-sifting was just one component of the walk on June 2. Hoffman, a marine educator at the center, kept children and adults busy with all kinds of activities. During the first half of the walk, Hoffman talked about the geology and biology of the beach. Walkers discussed sand dunes, seashells, sand colors and other tide trademarks. Later, Hoffman set the walkers to work- first by sifting sand and then by dragging a huge net through the water to catch small fish and other sea life. Every activity and every question was a chance for a new lesson. Hoffman talked about everything from fish shapes to barnacle growth. The children were especially interested in what Hoffman had to say. Hands-on participation kept them alert and involved. The nature walks are part of the center's mission to provide marine education programs to the public. The Tybee Island Marine Science Center itself houses a small museum and aquarium. Fish from the coastal area swim in a roomful of tanks. To the side, a touch tank lets children and adults interact with some of the sea life. Other exhibits in the center describe the life around the seashore and the damage pollution can do. The most appealing exhibit, according to center director Sue Brockway, is the display about sharks and shark's teeth. "We get kids in here all the time who have found a sharks' tooth and want to know where it comes from," she said. The Tybee Island Marine Science Center's value is its accessibility. Right at the water's edge, it can create a valuable link between what people see around them and what they can learn about the ocean and its environs. Although the center itself is small and provides very basic information, its proximity to the life represented in its exhibits make a trip well worth the time. The education programs, including nature walks, summer camps, school trips and lecture series, simply add to the center's value. The Tybee Island Marine Science Center is located in front of the pier on the island. Summer hours are 9 a.m. - 4 p.m., Monday-Saturday and 1-4 p.m., Sunday, Admission is $1 per person. Children 2 years and under get in free. For more information, call (912) 786-5917. The Tybee Island Marine Science Center conducts some programs year-round. But as summer beach visitors pour into town, programs and enrollment increase. Recently, the center started a summer schedule of Discovery Walks. The staff will conduct walks at 10 a.m. each Monday, Wednesday, Friday and Saturday until Sept. 4. The fee, for children 4 years old and up, is $3. The center will also hold "Tuesday's at Tybee," a lecture series, at 8 p.m. the first and third Tuesday of every month. "Federal Law for Endangered Species"
"Reptiles of the Georgia Coast"
"Is There Beach Sand in Your Toothpaste?" 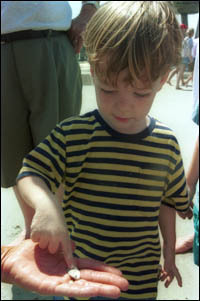 Tybee Island Marine Science Center holds a number of short summer camps throughout the season. In order to sign up, you must fill out a registration form. Each class is $45 per child. Immediate family, Seastar and Dolphin members of the Tybee Island Marine Science Foundation receive a 20 percent discount on each class. For more information, call 786-5917. "Under the Sea with Me"
Copyright 2000 Georgia Guardian. All rights reserved.